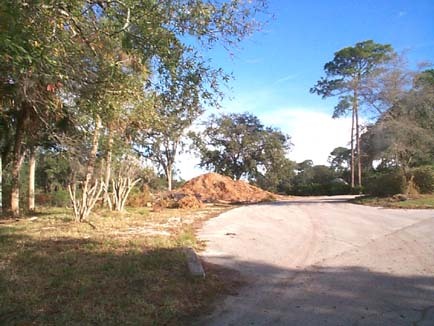 I just received by email your dissertation on Palm Harbor Golf Course and Palm Coast from Maccurach Golf this morning. Then while I was considering emailing you, my secretary also just sent your latest email requesting a URL site for improvement updates. I'm so sorry that I'm just receiving these. I understand Maccurach got your information a while back and thought I had also received it. I'm so pleased to have such a historian keeping a watchful eye on our progress. Anyway to bring you up to speed, we're pretty much just in the beginning stage. The city has done a little clearing and trimming for us while we were ironing out our contract with the golf course builder. Now they have just recently gotten started over the past two weeks with Thanksgiving cutting into some of this time. I'm getting ready to head out there today and see how the shaper is shaping things up. I'll make sure to take pictures as we move along and get those either directly to you or get with the city to see how they would like for me to handle interested locals such as yourself. 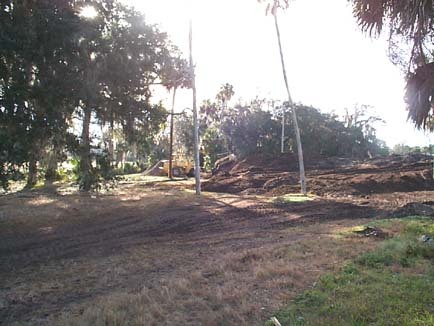 Saying it has been a long time coming, City Manager Jim Landon on Tuesday briefed members of the Palm Coast Citiy Council about the starus of the Palm Harbor Golf Course. "As you know, we have been in a design phase for a number of months now," Landon said. "Were ready to mover forward." Landon said he is excited about the golf course plans. "I think it's going to be a nice upgrade and really be a boost to this neighborhood," he said. Golf Course architect George Clifton, from Clifton, Exell and Clifton Golf Design Group, gave a presentation on the basic elements of the course redesign. "When we first looked at the problem, we had some constraints with the Centex tract>" he said, referring to the developer who previously owned the golf course property before offering it to the city. "One of the caveats they had is they had to keep the same number of units." in their developement. Clifton said the first step is to build a temporary clubhouse facility, utilizing the existing clubhouse parking lot. He then went through the design changes to the course itself, describing how some holes had been shortened or lengthened or had tee boxes or greens moved. In addition, drainage issues were addressed in the redisign., but overall the course would only be shortened by 25 yards. Landon said the Friends of Golf, a grassroots organization that advocated the city's takeover of the property has been involved in the design phase. "The only issue that I 've really heard is that we have an alternate for the cart path. Landon said. "It is an issue when it comes to playability right after rains." With design plans ready, Landon said the next step is to get bids on the actual reconstruction work. "we have also gone out to proposal for namagement conpanies," he said. "That opened last week and we got zero takers." Plans are to have a private company manage the course, including maintenance. Landon said all of the management companies that responded to the initial request for bids said the 5 year management contract was to short because of the burden of buying equipment and setting up operations would be costly. "The exonomy and tighter credit markets is having an impact on thi, too," Landon said. Landon said while hthe city is not in a particular hurry to get a management company on board and under contract, it should be involved in the construction phase of the project. Council member asked Landon how much a round of golf might cost at the course. "Forty to sixty dollars a round is the number that's been thrown around." he said. "That would include different rates for residents and non-residents. Council member Mary DiStefano was not pleased with the answer. "I'm just a little concerned about the cost to golf," she said. "I think for a municipal golf course, I thought we were trying to be a little less expensive." Landon said the goal is to be less expensive, adding that until a management company is found, what course rates would be is unknown. He added that economics should be the determining factor in setting greens fees. "It needs to be a business decision, not a political decision." he said. "We don't want to go to low because the golf course has to be self-sustaining." Landon aded that if rates are to high, golfers will play at other courses. "that is why you have a management company," he said. 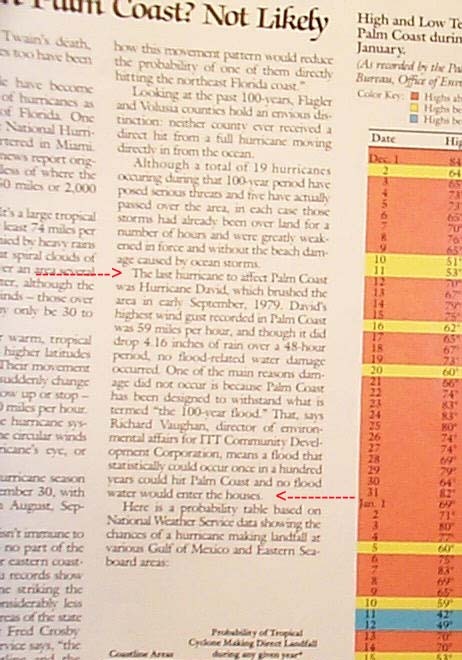 In the above Newspaper article it referenced 'Drainage Issues'. 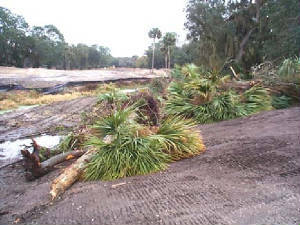 We do not have a club what that is all about since Palm Coast was designed and engineered to withstand a 100 year flood. We walked that course for almost 38 years and never saw drainage issues, Bill Amick , the original designer would not have left drainage issues, and certainly, Nancy Lopez, would not have played this course regularly in MUCK. Perhaps something may have come about because of the 'Greenbelt Sales' and the ' Wetlands Mitigation' since this place became a city .In out opinion, the pond thing was dug because it would be a water supply since the Pumphouse and other Properties in this Golf Course area was somehow strangely sold then supposedly *Gifted* or bartered or some such. We wonder how we could be *gifted* for what we already paid for. This is perplexing. The specific location of the C.B.S. Contemporary Clubhouse we were shown on the 'Company's ' official ;Guided Tour. January 1009. 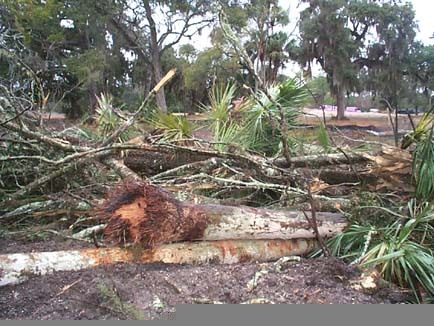 Oak Tree and Palm Demolition of the first Park in Palm Coast Jan. 2009. 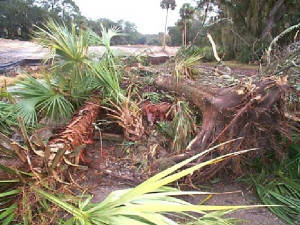 Oak Tree and Palm Demolition at Palm Coasts' first Childs and Neighborhood Park Jan. 2009. 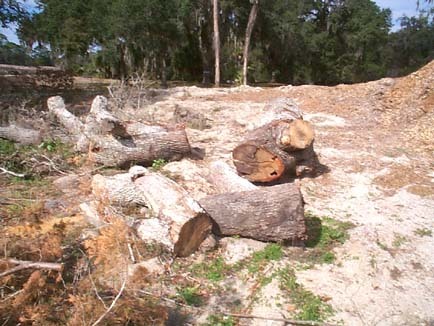 Yet more Oak Trees hacked down 02-2009 = what about conservation and preservation per the 1976 FTC? 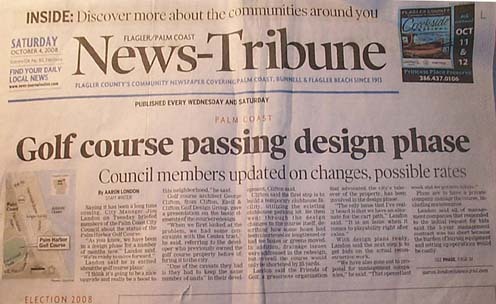 We will continue to remain Stewards of all this Information and Items, hoping for a Museum like Flagler Beach already has, hoping for a Certified Local Government like so many other Florida Leadership Cities already are.